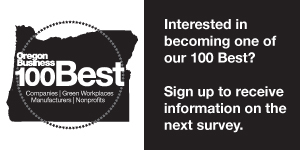 Oregon Business - Celebrate the 6th Annual 100 Best Nonprofits to Work For in Oregon! Celebrate the 6th Annual 100 Best Nonprofits to Work For in Oregon! BACK THIS YEAR: Organizations that purchase a table of 10 seats will receive a complimentary 1/6-page size, color advertisement in Oregon Business magazine – a $1,260 value. A representative of Oregon Business will contact you to make the arrangements. Design assistance is available if needed.